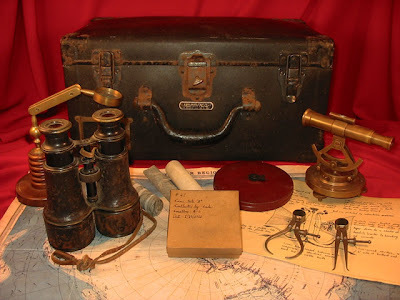 In Part One of the "From the Mountains of Madness" project I talked about selecting a case to hold all the artifacts and why I chose the one I did. 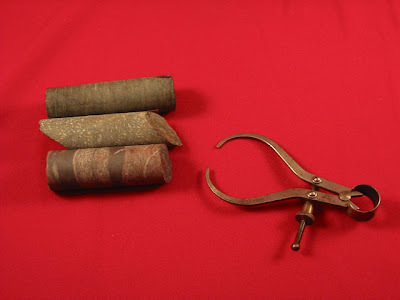 Part Two discussed scientific specimens you might want to include based on what Lovecraft's story actually describes, with a brief foray into making muslin storage bags for the samples. 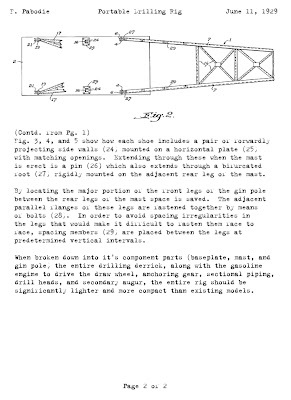 Part Three covered how to obtain rock cores for the project and the creation of Pabodie's plans for his revolutionary drilling rig. In this installment I'll add a few more items to the case and turn a jewelry box into a specimen case. One of the reasons for such a long delay between this installment and the last one is that I decided to build a large light tent to help improve the quality of my photos. It's just a basic framework of PVC pipe draped with a white sheet, but the diffuse illumination it provides has helped eliminate the glare problems I was having with my earlier photos. Isn't that better? The diffuse light gives reflective items some nice highlights without generating blinding glare. With a little more tweaking of the light arrangement my pictures might be able to transcend my lack of photographic ability. 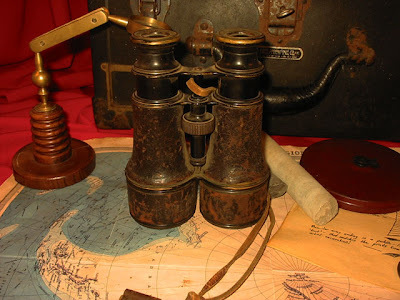 Here's the first major addition for this update: a pair of Lemaire Model IV binoculars. Made from leather covered brass, these were produced from the 1880's to the late 1920's at the Lemaire factory in Paris. During that time the design was basically unchanged other than some upgrades to the quality of the optics. Once again, I chose this particular brand because it was carried by the Byrd expedition Lovecraft used as his model for the Miskatonic expedition in "At the Mountains of Madness". 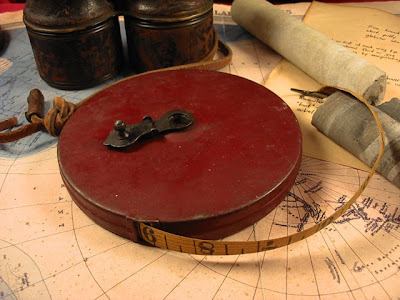 Here's the second major addition: a Lufkin 100 foot surveyor's tape from the late 1920's. It's in amazing condition for it's age, especially since the ruled tape is made from oiled linen. In my mind's eye I can envision Lake carefully marking off the survey grid inside the underground cavern with a tape just like this one. Finally, this is a specimen box for one of the fossils collected from that same cave. It started life as an off the shelf cotton-lined jewelry display box made from kraft paper. After giving the edges and corners a light sanding I hit it with a spritz of walnut ink to age it and then rubbed it down with cocoa powder and some powdered charcoal to add a little grime. The collection notes were written with a medium nib fountain pen using brown ink. The trilobite fossil is a resin reproduction that I picked up years ago as part of an educational toy set. Since then I've been desperately trying to find more of them, but it looks like whoever owns the molds quit casting replicas and is now using them to produce soap. The only modification I made to the fossil was the same grimy cocoa and charcoal rubdown I gave to the box. Official seals are one of those little touches that help make prop documents believable. Designing one can be a job in itself, but if you're pressed for time or don't have a graphics program you should give the Official Seal Generator a try. It's a suprisingly flexible online application that can handle everything from simple notary seals (handy for dropping into fake official documents generated with word processors like Microsoft Word or OpenOffice) to more complex designs. The available fonts and emblems also have considerable amusement potential. It's turning into a banner week for Cthulhu propmaking. First there was the new Cephalopod Productions site and now there's the MRX Designs blog, featuring a variety of Mythos-related props and some impressive tomecraft. FriedGeek has posted a video on Youtube showing a time-lapse view of him sculpting a Cthulhu idol. I'm looking forward to seeing more of the sculpting process as it progresses, particularly because he seems to be basing his sculpt on Lovecraft's famous Cthulhu sketch. 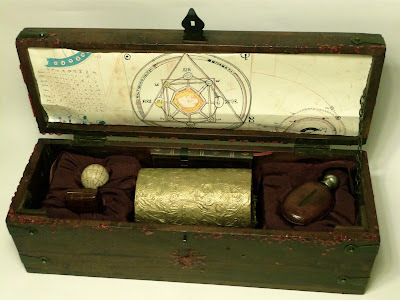 Via Curious Goods, back after a long absence, comes this wonderful mysterybox created by Bruce Wright for his wife. 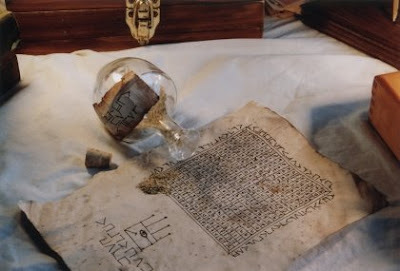 The photos at the linked page detail every aspect of the box, based on the discovery of the Philosopher's Stone by Nicholas Flamel in the Harry Potter universe. The included artifacts are wonderful, but I particularly like how the paper props tie everything together into a cohesive whole. Cephalopod Productions is a brand new blog focusing on many of the same subjects as this one. It's just getting up and running, but you can already see some incredible physical props and a useful selection of printable documents. 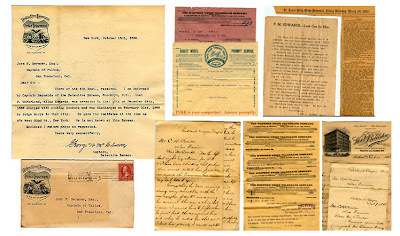 The online component of the Spy and Private Eye Museum in Austin, Texas has a treasure trove of Antique Investigative Reports. The collection skews towards the late 1800's and early 1900's, but it's usefulness as a source of quality references and inspiration should be obvious. 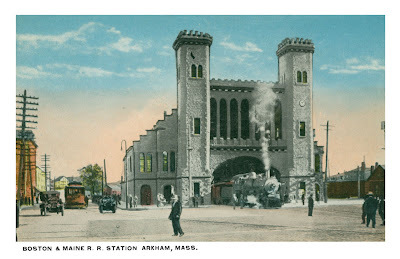 The source material for this project is a vintage postcard from 1919 depicting the Salem, Massachusetts railroad and trolley station. I chose that particular card for a couple of reasons. First, Lovecraft based many of the details of Arkham on Salem so it's only natural that we can map the period features of the real town to his fictional creation. 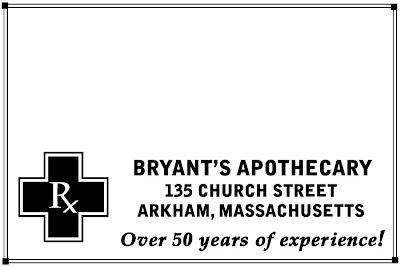 Second, the station is a named location in the "Arkham" supplement from Chaosium that players are likely to visit or at least be aware of. 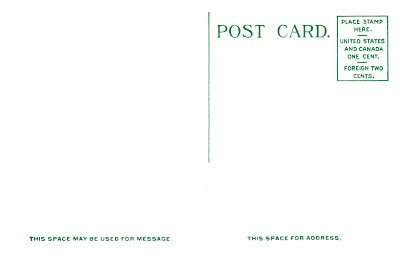 Finally, and perhaps most importantly, the original card was produced before the magic year of 1923. That means it's now in the public domain and I'm free to use it any way I want without any copyright worries. After scanning the original I did some basic cleanup work to remove the dust and dirt that had accumulated on the card over the last eighty some years. I had originally intended to replace the existing Salem-specific caption with a new one generated using a matching font, but after fiddling around for an hour I couldn't find one that matched the lettering on the card. Since that's about the limit of my short attention span I decided to recycle the existing caption and generate any additional letters using bits of the printed text. The letter "K" in Arkham is a bit dodgy, but it's good enough to pass a casual inspection. Here's the final file at 300 DPI sized to reproduce the 5 7/16" by 3 1/2" measurements of the original. Just click through for the high resolution version. The good news is that as of today I'll be able to spend a lot more time working on props. The bad news is that...uh...as of today I have a lot of free time to work on props. Heh. Fortunately, this isn't a totally unexpected development. My chosen career of broadcasting has been undergoing seismic changes for the entire two decades I've been working in the industry. That's over twenty years of moving from market to market across the northeast United States, never staying in one place for long before moving on to the next gig. That's one thing I'm not going to miss. Maduncle at Antipodean Steampunk Adventures has been creating some incredible steampunk-influenced designs. These are the kind of infernal devices I can only aspire to. It's not just the props that are impressive. You'll also find easy to follow build logs describing the creation of each object. 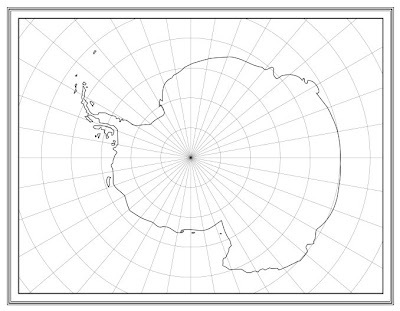 This map of Antarctica doesn't look like much now, but when it's done it should be a fantastically useful tool for running "Beyond the Mountains of Madness". Once I have the basic information sketched in it will be almost endlessly customizable as anything from a blank map for the players to track their progress to a full color period map. Low-budget film website Indymogul has a great video tutorial on creating frozen actor make-up. 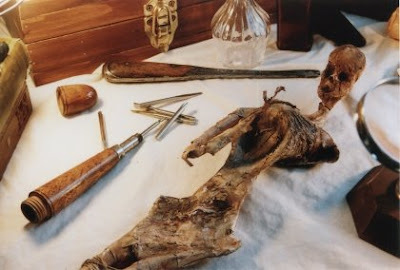 The technique is perfect for anyone doing an Ithaqua-based "Cthulhu Live" scenario and has the advantage of using materials you should be able to find at your local drugstore or beauty shop. Another quick and easy bit of Cthulhu clip art- the elder sign. Nothing fancy, just the basic symbol. Click through for the full sized version. 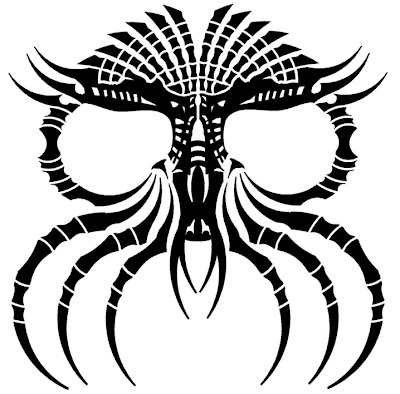 Another bit of Cthulhu clip art for your prop documents. 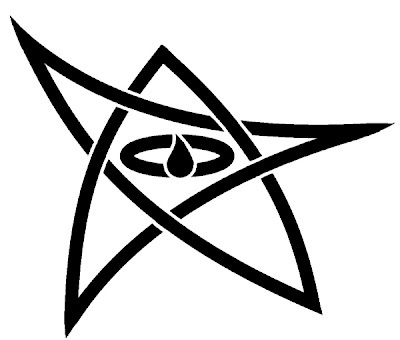 I've been using this particular sigil for years on scrolls and such, but I think it's most notable appearance was as a bit of tattoo flash. That's right, there are at least two guys walking around with this permanently inked on their skin. As always, click through for the full sized version. 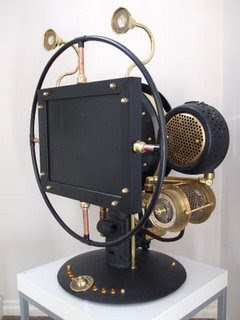 Via the Brass Goggles forum comes the Televisor Museum International, a stylish site documenting the history of televisors from the primitive models of the 1880's to the mass produced ones of the 20's and 30's. The museum's collection is truly inspirational. In case you were wondering, yes, it's all fake. Although the televisors are fully functioning they're artifacts assembled from bits and bobs of furniture, hardware, and obsolete technology by artist Steve Gompf. That kind of creative kitbashing has exploded in the "Steampunk" sub-culture, such as it is, but it's rare to find anyone producing pieces that look this good. Although Andrew Leman of the H.P. Lovecraft Historical Society was doing it years ago with things like the ElectriClerk and Transdimensional Helmet. You can listen to an NPR radio feature about Mr. Gompf and his work over here. Technically it's an apothecary and not a pharmacy, the difference being that the first concentrates on producing custom blended compounds while the second primarily dispenses, but it's a bit of a tomatoe/toomato distinction for game purposes. You can print these out on sticker paper or use regular paper and then adhere them to a bottle or package using a glue stick. Both the color and black and white versions are at 300 dpi and sized for a 3" by 2" label. As always, click through for the full sized graphic. The upper half of the label is used to identify what the preparation or compound is and how it should be used. In the 1920's that included insecticides and cleaning compounds in addition to the more traditional pharmaceutical goods. 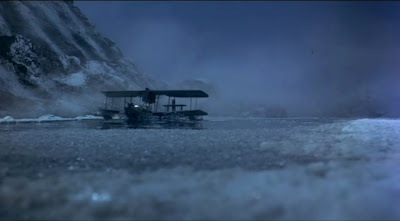 It's going to be some time before a film version of "At the Mountains of Madness" ever hits the big screen, but if you're in the mood for another disturbing tale of an Antarctic expedition gone horribly wrong you need to pay a visit to Hulu. The site specializes in streaming episodes of television shows and full-length movies, and one of their featured films is "The People That Time Forgot". It's a mostly-forgettable 70's era adaptation of the classic Edgar Rice Burroughs story, but for my purposes it's a goldmine of potential material. 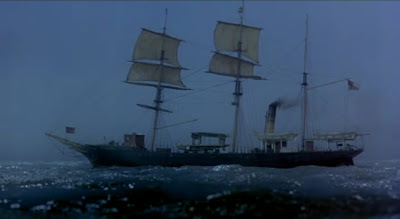 I expect I'll be recycling some stills and video from the film in my games, particularly the opening and closing segments featuring a steam-powered barque that can double for the "Arkham". Amazingly, it also features a Dornier Wal! 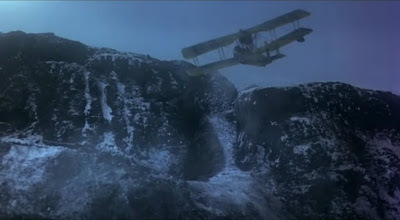 It looks like the studio had the hull of a Wal handy, but both the model and live-action versions of the amphibious plane used by the adventurers features a bizarre biplane wing configuration. The upper wing and engine are attached to the mounting struts present on the Wal, but the lower pair of wings use the distinctive sponsons of the plane as wing roots. Beyond it's prop potential there aren't many reasons to recommend the film. It's obvious the production design suffered from serious budget problems. Everything from the late 19th/early 20th century setting of the film looks great (since they could draw on the studio's collection of props, costumes, and sets), but the quality totally tanks once the party crashes into the hidden tropical paradise beyond the Antarctic mountains. 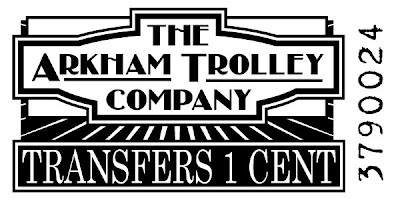 If you're running a prop-heavy "Call of Cthulhu" game this Arkham trolley ticket makes a nice wallet filler, but it can also serve as a useful clue to someone's movements around the town. It looks best if it's printed out on a light-colored sheet of construction paper or card. If you have a color printer you might want to modify the ticket number to print out in blue or red ink for a more realistic appearance. Since it's sized for a 1" by 2" ticket you can print out a couple of copies at once on a sheet of paper and then trim each ticket out individually. If you're really dedicated there are a couple of things you can do to make it even more realistic. Duplicating the perforations of a real roll ticket can be accomplished by running a pounce wheel along the short sides. Hit the corners with a hole punch and you'll have a good facsimile of the notches used to make ripping the tickets off the roll easier. If you have a any custom punches you can use them to simulate a ticket that's been used on a transfer. Just click on the picture for the full-sized version. The Replica Props Forum, one of the oldest and largest communities on the net, is currently accepting registrations. 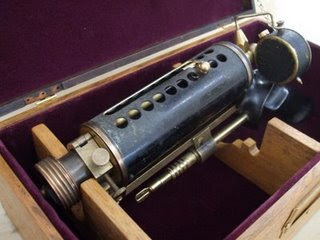 While discussions of Mythos related props are relatively rare the amount of information to be found there is truly amazing, ranging from obscure tidbits about the golden idol from "Raiders of the Lost Ark" to how to paint a screen accurate phaser . If you would like to sign up just head over here. The current round of registrations will close on the 15th. Few things compare to combining Martha Stewart and Cthulhu in a post to get the ol' hit counter up. Heh. In Part Two of the "From the Mountains of Madness" project I mentioned that you could use a photocopy of an image to transfer it to an object, in that case a muslin bag, without giving any real details on how to do it. 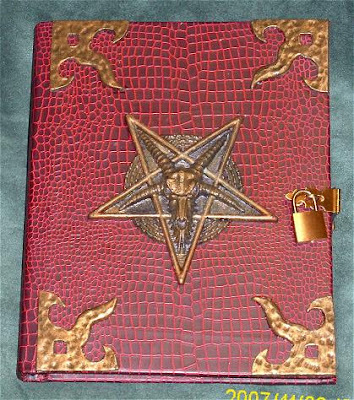 That was a bit of a dodge on my part, since I used a rubber stamp and permanent ink to put the Miskatonic University seal on the example bag in the post. If you don't happen to have a stamp, like the vast majority of people in the world, my post was a bit light on actually providing any help. Luckily, not everyone is as lazy as me. There are a number of tutorials on doing a photocopy transfer available, starting with the very simple Martha Stewart method that takes advantage of the solvent in a regular art marker to effect the transfer. A poster on Gardenweb has an incredibly detailed tutorial over here. Her method uses xylene, but any paint thinner will do the trick. One of the easiest to obtain solvents is acetone, which you'll find in almost every grocery and drug store in the world. You'll find it in the nail supplies section because it's used to remove nail polish and the adhesive that attaches acrylic nails. Just make sure you get pure acetone and not the acetone-with-conditioners used in conventional nail polish removers. It's also a good idea to make sure you have good ventilation and a pair of rubber gloves, since the chemicals involved aren't exactly benign. 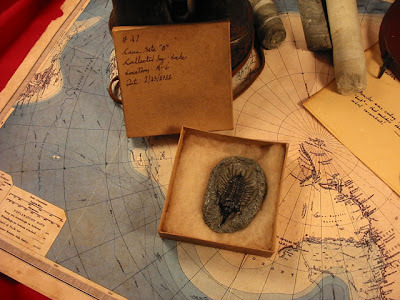 In Part One of the "From the Mountains of Madness" project I talked about selecting a case to hold all the artifacts and why I chose the one I did. Part Two discussed scientific specimens you might want to include based on what Lovecraft's story actually describes, with a brief foray into making muslin storage bags for the samples. This segment of the project will deal with a specific example of those samples- the rock cores bored out by Pabodie's revolutionary drilling rig. These three are all about 3" in length and cost me around $5. The calipers next to them, another artifact that would logically be part of Dyer's collection, cost $1 at a junk shop/antique store. Add some labels describing where the samples were taken, drop them into one of the sample bags from Part Two, and this part of the project is complete. Well, almost complete. 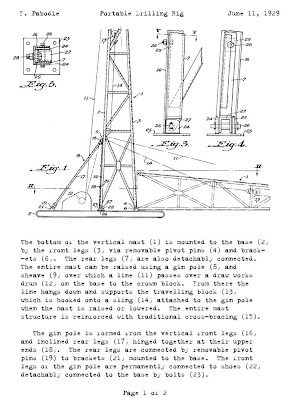 For the finishing touch you can add a copy of Pabodie's original specification for the drilling rig. Just click through on the example pictures below, print them out, and age them. The Pabodie rig diagrams are CC licensed, so they're freely available for personal use. Happy New Year! I did indeed finish the lightbox, but I have to pick up some more lights this afternoon. In the meantime I finally added annotations detailing the source material in my fan trailer for a "At the Mountains of Madness" movie on Youtube. Click on through to watch the high-res version, or you can watch the low-res video here.